SEATTLE'S GREATEST native-son musician, Jimi Hendrix, has been gone now for almost four decades. His music is considered immortal & his image remains iconic. Sadly though, Jimi's memory continues to be dragged through the mud of endless courtroom battles. In February 2009, yet another Hendrix family feud was settled in a legal judgment that favored the position of the family faction headed by step-sister Janie Hendrix – & against a firm associated with Jimi's brother, Leon Hendrix. 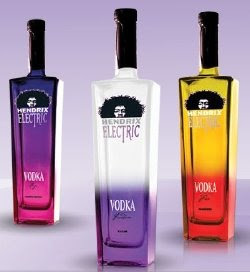 At issue was the recent marketing of alcoholic products called Electric Hendrix Vodka. Janie's March 2007 lawsuit challenged Leon's assumed right to exploit his brother's name, & asserted that the use of Jimi's image to promote booze was an affront: the Seattle Times quoted her statement that "As a matter of strict policy, we have never promoted an alcoholic beverage ... In view of the circumstances of my brother Jimi's death, this attempt to associate his name with the sale of alcohol beverages amounts to a sick joke." Well, yes and no. While Jimi-related booze is itself a distasteful concept – given that an over-abundance of red wine played a role in his death in 1970 – the fact remains that Janie's company, Experience Hendrix, did help promote (& sell through their Hendrix product gift catalog) 750ml bottles of Celebrity Cellars' 1997 vintage de-alcoholized "Red Table Un-Wine." Made from "premium grapes grown in select California vineyards," the juice (60,000 bottles!) is purportedly "rich and smooth with complex aromas and subtle flavors." While Experience Hendrix may wish that they had never tied themselves to this product – which bears Jimi's photograph & "signature" on the label – the nicely aging bottles are 100% proof that they did.